As it turns out, the same “ever-loving Iowa stubborness” that Meredith Wilson wrote about in The Music Man was in his very own DNA twice over, having not only been born in the Midwestern state of down-to-Earth hard workers but also at the right time of year to qualify him as a stubborn Taurus bull. By channeling that stubborness into his smash 1957 Broadway musical and holding onto it all the way up through the making of the 1962 film, Wilson ensured that the result of his labors would result in classic movie musical perfection. 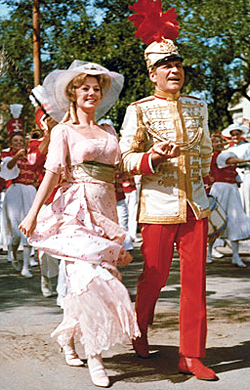 And you don't even need to take this critic's word for its merits as forty-three years later, The Music Man was included as one of the Library of Congress' National Film Registry titles for preservation as a historically significant work of American artistry. Likewise undoubtedly the reason the musical worked so well both on stage and screen is because of its pitch perfect casting of then supporting or B-movie player Robert Preston who'd never sang before in his career up until that point. However, he was so dynamic in his role that even when Jack Warner of Warner Brothers tried to talk Cary Grant into taking over the role of the traveling con man who sells fake marching band gear to prevent youthful bad behavior, Grant declined because he even knew that it had to be Preston. And although the legendary blue-eyed crooner Frank Sinatra was also in contention since Warner Brothers feared that the lack of a strong name would hurt the box office, ultimately Wilson was the stubborn holdout ensuring that the film literally wouldn't be a film without Preston and figuratively he was right. Captured in exquisite Blu-ray that pushes the quality of everything to unparalleled heights, the Warner Brothers disc just begins like an anticipatory audience member who can't deal with a menu when Preston's hilarious turn is waiting just beyond it. Transferred in its widescreen glory, which reveals the subtle nuances found in the wild dance numbers that manage to sync up large ensemble cast mates complete with props and complicated choreography and blocking to go in perfect time with the music, I've never seen the film look as wonderful as it does here. While Warner Brothers has struggled with sound balance and muddied color tones in some of its newer releases, The Music Man is one of the studio's strongest transfers in recent memory. Likewise, the film surpasses its former editions in a way that previously this Oscar nominated (winner of Best Score) and Golden Globe winning Best Picture of 1962 didn't have the opportunity to showcase before. Featuring an adorable early performance by Ron Howard as a delightful young boy who discovers that music helps his lisp, the film takes a Rainmaker style set-up in its period approach of 1912 Iowa. After the lengthy musical credit sequence, we encounter the fast talking, smooth operator Harold Hill (Preston) who arrives to scare some money out of River City, Iowa by ensuring the residents that they have a nonexistent juvenile delinquency problem with the kids of the community who may be using pool as a gateway game into more serious offenses like disobedience. Selling a boy's band as the solution to the problem complete with expensive fees for instruments and costumes, although his musical practice as “Professor” Hill never involves playing a note, for the most part River City buys his lie because-- just like imagining what the music will sound like in their heads-- they want to believe in the kindness of a stranger who's suddenly given them the self-confidence to be whatever they'd like to be. And conveniently, whenever “Trouble” arrives “right here in River City,” Preston sings his way out of the jam “with a capital T,” by using a dialogue driven bait and switch, launching into impromptu music numbers, flattering anyone and everyone in sight so that they feel indispensable and musically gifted. Yet there's one person he realizes he can't play like one of his “76 Trombones,” and that's the lovely, buttoned-up librarian played by Shirley Jones who is featured in the disc's bonus features. Of course, the attempt to woo the woman into distraction which begins as the old, “give a dame a thrill” routine before he mistakes Jones for a “fast woman,” is as predictably familiar in a musical as is the moment that he realizes he has true feelings for her. But in this particular case, it's all just so infectious, breathless, feisty and inspired fun that you can't help but get caught up in the film no matter how many times you've seen it. 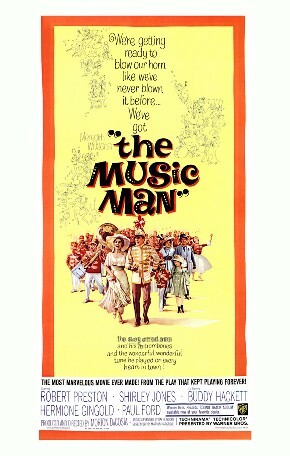 Despite its daunting running time, unlike My Fair Lady and some of the other musicals of the early 1960s before they began to crash towards the '70s counter-culture antihero/anti-establishment era, The Music Man doesn't overstay its welcome by the rare fact that it gets better as it continues. Following a remarkably strong start, Man lags a little bit but instead of losing the melody, the stubborness makes it work. Music Man quickens the pace and inserts subplots, humorous repetition that pays off unexpectedly, and an extremely ambitious approach that makes the film really come alive in the transition from stage to screen. And the film is surely helped by its breathtaking approach that airs out the stage production with wide shots of Iowan streets but especially because of the determination of Meredith Wilson to get his material right with the casting of Robert Preston whose performance pops off the screen in a way that's even more impressive than this superlative Blu-ray, which is one of 2010's strongest so far.